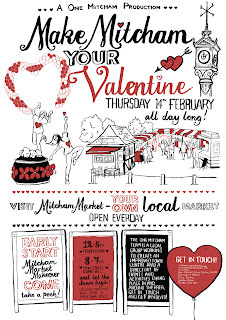 Thursday 14th February 2013 brought love and romance to Mitcham for Valentine's Day in the form of the Mitcham Valentine's Market. The event was the first in a series of events designed to revitalise the town centre as part of the Rediscover Mitcham project – a multi million pound project to improve Mitcham town centre. 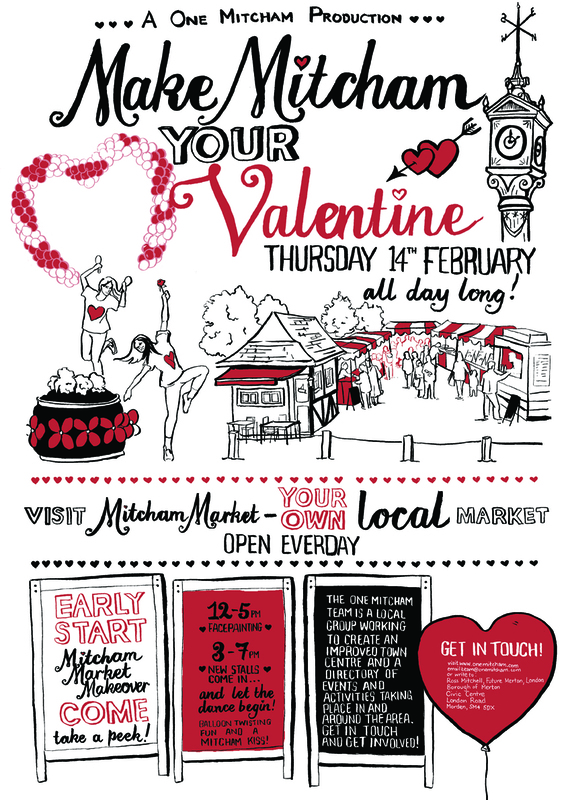 Organised by One Mitcham and funded by the Mayor’s Outer London Fund and Merton Council, Mitcham town centre was transformed into a romantic haven of hearts, flowers and cupcakes. A timetable of highlights included dancing, balloon twisting, facepainting and even free tea and cake! The events ran into the evening with dozens of jazzed up stalls to invite the local community to the event. I had the honour of working with the Architects Studio Weave to decorate the market stalls by hand lettering romantic signs such as "Hello Sauce Pot (kitchenware)" and "Get Fruity (greengrocer). The day was an enjoyable event and I was able to have a chat with the stall holders about the project and what they thought of the revamped market. There was also a bit of spontaneous sign making on the day too which kept me busy. This year went off to an exciting start with the preparations for the Call of the Wild exhibition curated by my fellow Kingston alumni illustrator Laura Hughes. Artists were asked to create an original piece in documenting the wilderness in the city. There was some really exciting work from the likes of Colourbox and Sandra Dieckmann. Plus there was a jam packed merchandise table at the end of the room selling prints, cards and trinkets which proved to be a real hit at the Private View. My London Wild gate below with some pics of the exhibition.